How to Make Money on Your Website? –Let’s Build an Online Business. Did you know that there are over 1.1 billion websites on the web already? That’s a BILLION, not million and if there’s a lot of websites out there, you can just bet how many users are there on the web (There’s around 3 billion internet users by the way). The internet is slowly changing the World today so much so that many people find ways to earn money online by building an online business to leverage that. So if you are interested in starting a money-making website on your own but have no idea how, I hope this article will give you some great insight to help you get started. Why Do You Want to Earn Money on Your Website? Second income stream – Relying solely on your job income is not a wise plan as not only will we risk getting fired as the company pleases, the salary also doesn’t come when we stop working. Ease of use – Should anything happens and you need to get away from life for a while, you can simply withdraw money from your computer anytime you please, simply with a click of a button. Backup plan – You always need money for an emergency situation that will happen every now and then in life because like it or not, things will never go according to plan no matter how much we prepare for it to be. Medical and insurance – Sure we don’t use them much except for when we really need them but medical and insurance are often very pricey. Personal growth– You can use that money to spend on training or talks to improve your skills today. You can help other people – Sometimes we feel like helping all the people who undergo misfortune but we just don’t seem to have an extra cash at hand. Vacation time! – Don’t you feel jealous whenever you see your friends going on vacations to places like Japan, Malaysia and Bali but you never seem to have enough cash in hand to go there as well? Everyone needs money, we are just too stubborn to admit and too reluctant to work for it! What Do You Need to Know About Making Money From Your Website? –Important Facts! This is called a SPAM and if you get this in your inbox, avoid this at all cost! 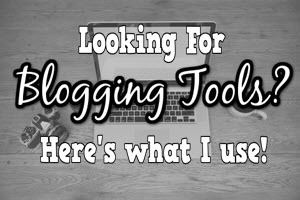 When I first started in Internet Marketing, I had NO idea on how to start and make money online so I looked for anything that came to me first. 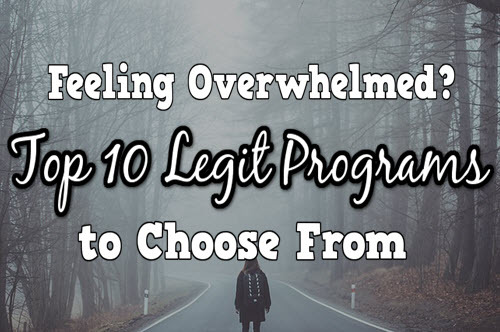 You CANNOT make millions overnight – If a program looks too good to be true, 99% of the time, it is! These scam gurus know we need money which is why they are putting that belief of making millions overnight when in reality, you can’t. Making money takes time – Although a website is the best medium for a long-lasting business, it doesn’t reap rewards immediately. In fact I cannot guarantee that you can make any money within the same week but if you keep persevering, you can start earning after week 3. You cannot make millions – Unless you’ve been managing your site for 10 years and it’s as big as The Huffington Post, you need to face the cold hard truth that you can’t make millions at all. In fact, many Internet marketers earn an average of $3,000 – $7,000 a month but if you continue to maintain your website and keep creating content, it will grow drastically starting from year 2. One of the best ways to make money online, Affiliate Marketing is a method whereby you sell other people’s products in exchange for commission. Think of it of being a salesman or saleswoman, only that it’s online…and probably in your pajamas. To do Affiliate Marketing, you simply need to go to either Amazon.com for the best physical goods product to sell, or ClickBank.com for the best digital products to sell. 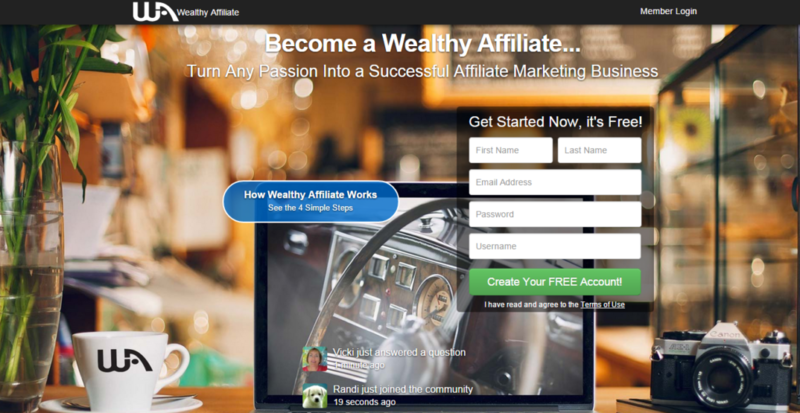 There is a program which specializes in teaching you everything you need to know about affiliate marketing called Wealthy Affiliate which I would highly recommend you to check out. Banners are those ads you see on the sides, the bottom or even top of a web page and although they look dodgy, they do in fact make a load money if done correctly. So how do you earn money from banners? When your website has reached a certain extent of fame, some Internet Marketers will ask for your permission to promote their product banner on your site in exchange for money. Or, you can also promote your own product if you have one. 3) Create your own digital product! One of the methods that reap the most rewards is by selling your own product, particularly an e-book that aims at solving a problem. If you are just starting out, I wouldn’t recommend this yet because creating your own product takes time as not only will you spend months to write, revise and plan, you need to build your reputation which would take up a lot of effort. Beginners who are new to the Internet Marketing world go for affiliate marketing because you can start selling right away and make money by leveraging other people, hard work and believe it or not, this is also a great way for you to learn from them. Asking for donations is against my principle for making money but if it’s for an important cause, it should be okay for you to use this method. Organization websites have better use of this as some of those websites are non-profit and they have no intentions of being biased for money. However they do need money and their audience are very much likely to give donations because they support the website. I’m sure you’ve been to a website and saw a form to request for a newsletter? Well that newsletter thingy is actually a way to earn some money as well! 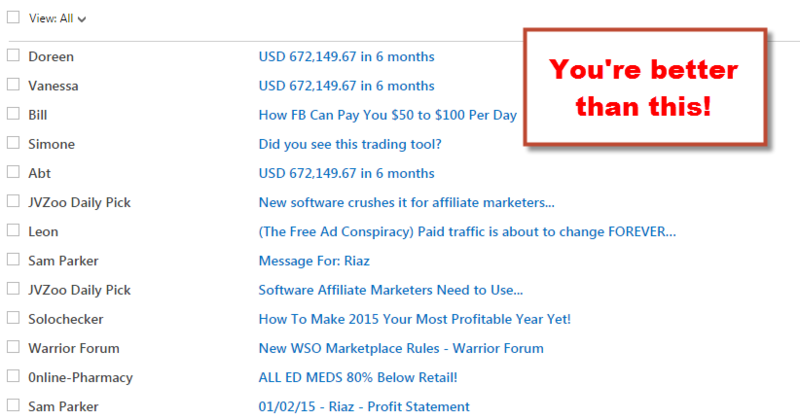 It may not look like it but a lot of people make loads of money from Email Marketing alone. This is because you can’t rely on Google to bring you traffic because even after you get people to visit your site, not many of them are going to be your buyer. BUT many of them will want to subscriber and when they do, THAT is when you can start building trust with them by leading them back to your website and before you know it, they are back at your site to buy more stuff! Become an Online Entrepreneur – Join an Online Business Community! To become an online entrepreneur, you need to learn from the best and what better way to learn then to go where they are at? Wealthy Affiliate is the best Online Business community to date and why every successful Internet marketer joins there is because of the online classroom it provides which updates regularly. 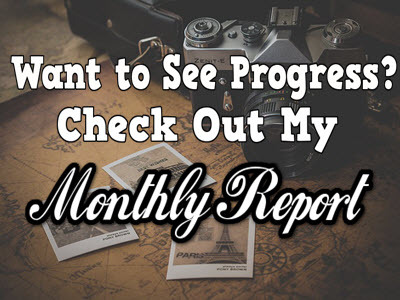 It is free to join for beginners and veterans alike as the lessons are vast, covering almost anything there is about making money from your website. Using the knowledge I learned at Wealthy Affiliate, I managed to get my website up on the first page of Google and you can too by creating a $0 starter account here. Becoming an Online Entrepreneur is actually very interesting. As long as you educate yourself on what your website needs, have realistic expectations and learn how to increase conversions, your website will be making you money in no time! If you’re interested in learning more about building a viable business online, check out my #1 recommended program here. 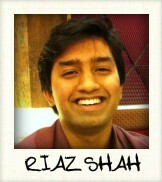 Hi Riaz, your site looks great! I like that you write it in small paragraphs, it’s so easy to read and understand. 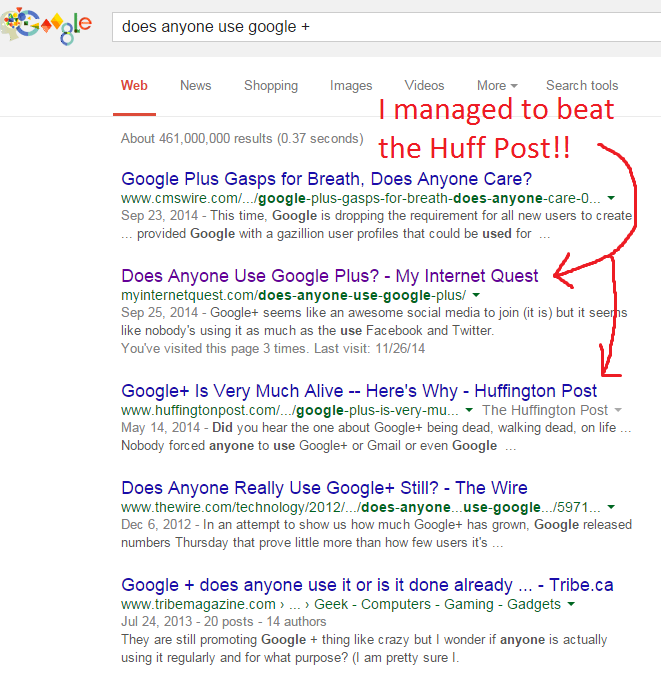 And wow, beating the Huff Post?! Hello there Sylvia, thanks! I’m not much a reader myself so I try to write in a way that everyone can read easy and I’m guessing you proved me that :D. Thanks for dropping by, cheers!